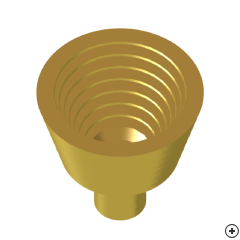 Image of the Waveguide-fed Corrugated Conical Horn. 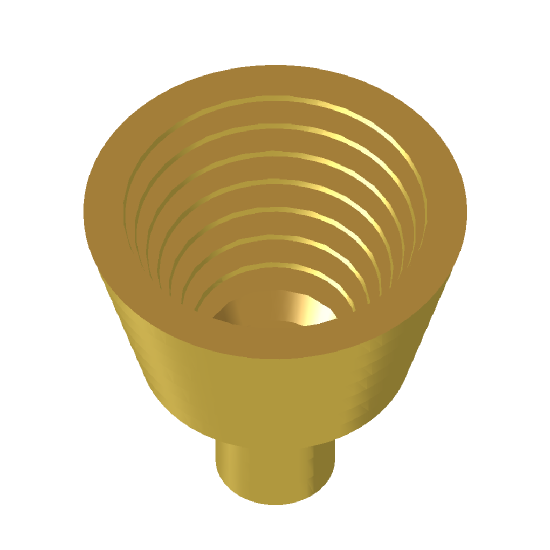 The smooth wall conical horn antenna is practical in the microwave band, where it is, often used as a feed for communication or satellite dishes and radio telescopes. Its mechanical body of revolution symmetry allows any polarisation of the exciting fundamental (TE11) mode, including circular: for example by using two orthogonal coaxial to waveguide transducers driven in phase quadrature. Normal smooth-wall horns present problems that can be eliminated by corrugating the walls. Problems include unequal beamwidths in the two planes; non-colocated phase centres in orthogonal planes; higher sidelobes in the E-plane than the H-plane, without means for reducing them; and diffraction off the E-plane walls, causing backlobes. The horn design provided here is for linear polarisation.